Keeping students and staff safe and protected is always a top priority for educators. One safety issue often overlooked is the weather. Even on those beautiful, bright, sun-shiny days, care should be taken when outdoors. It’s important to shade yourself from the sun during the summer months and in areas with hot climates. 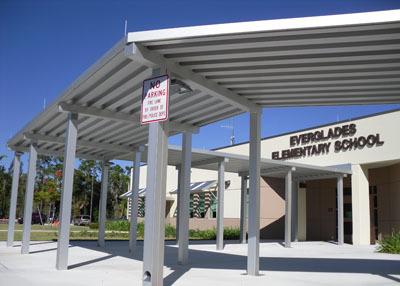 One of the best ways to obtain shade is to install aluminum walkway covers throughout your school. Students and staff do a lot of walking throughout the day, going from homeroom to classroom to lunch to P.E. to… well…everywhere else. And when students are waiting on the school bus or for carpool, they should be kept safely out of the sun due to their sensitive skin. Do students “hang out” before and after classes and during lunch break in sun-prone walkways? Consider these the perfect spots for aluminum walkway covers. Staying cool and comfortable, and most importantly, out of the sun’s harmful UV rays, is a key safety matter. 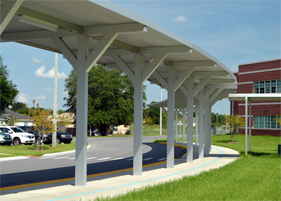 Walkway covers offer an aesthetically pleasing form of shade and protection that can be constructed to fit into the unique design of your school. Now that we’ve discussed great weather, what about inclement weather? Do your staff and students find themselves running through the rain just to get from one place to another – arriving damp or drenched with soggy papers? Do they congregate in hallways, causing a potential fire-hazard, just to stay dry? Aluminum walkway covers can take that nightmare away! 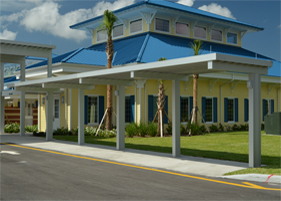 Perfection Architectural Systems offers long-lasting protection from harmful weather elements such as rain. Perfection walkway covers are also engineered to withstand high winds, heavy rains and snow – meanwhile meeting your area’s building code mandates. What’s most fascinating about Perfection’s aluminum walkway covers is the cost. 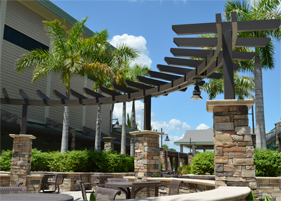 Walkway covers are a fraction of the cost compared with standard brick and mortar walkway solutions. And Perfection offers gorgeous custom designs with custom finishes that will enhance and not obstruct the view of your campus. 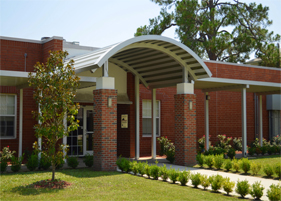 Call Perfection Architectural Systems at 800-238-7207 today to learn more about all of our products and what best fits your school’s needs.